2007-06-13: Added Ray Jordan report + pictures. The King and Queen of Rackets, 2007. Magnus Eliasson, Sweden. Martina Kakosova, the Czech Republic. For more details read Racketlon.com journalist Ray Jordan's report below. 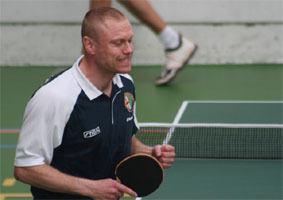 The 2007 Win for Life King of Rackets (or Belgian Racketlon Open!) once again lived up to its high expectations in proving to be a fantastic tournament for the 4th year in a row. Most of the features from the previous year's World Championships had been kept and the atmosphere among the competitors was as good as it has ever been. The tournament itself was of a high standard and in particular the ladies A class was incredibly close. Before the event it was impossible to predict the winner and when it got down to the 4 semi-finalists the result was no clearer. All 4  Susanna, Silke, Marielle & Martina  had won a tour event in the past year or so and all 4 (it seemed to me) were capable of winning here in Belgium. In the first semi-final Susanna and Silke went into the tennis level after the first three sports were all quite close. The Finn would have been strong favourite to progress to the final at that stage but Silke showed you cannot predict anything in today's racketlon by winning 21-13 and going through. In the second semi-final, despite a heavy 21-1 badminton win for Marielle, Martina showed her strong squash/tennis combination by defeating the Dutch girl 21-10, 21-5 in the last two sports and going through to her second final this year. The final between Martina and Silke was another tight affair. The German got off to a decent start with a 21-14 win in table tennis and followed this up with a 21-18 win in a scrappy badminton match. No panic in the Czech camp yet as the latter two sports are Martina's strongest, but Silke, also a decent squash player, claimed a 21-19 victory and headed into the tennis 12 points clear, needing 10 for a win. Martina however gave no mercy and thrashed Silke 21-1 in tennis to become this year's ladies' champion  an excellent match for the final. Susanna took 3rd place against Marielle with another very close (+2) victory. Agata Doroskiewicz won ladies B with victory in the final over local player Els Van Deynse. The main men's event had a very familiar look about it  probably because it had the same semi-final line-up (and results) as in the Czech Open a couple of months ago. Marcel came through a tough quarter-final with Oliver Kudicke to face number one seed Magnus, who once again defeated him before the tennis although the Austrian won the badminton this time round. The second semi-final was closer as Calum Reid defeated John O'Donnell by 6 points  an excellent 21-9 table tennis win got the Scot off to a great start in this match. The final between Magnus & Calum was unfortunately not as close as their Toronto encounter previously this year (Eliasson won that one by +13 (tt:21-19 ba:19-21 sq:21-17 ba:18-9)). Calum did get off to another great start by winning the table tennis 21-11 and at this point an upset looked possible, especially given that Calum won the Toronto badminton set between them. Magnus however, refocussed and took the badminton 21-13 with the more aggressive play. Onto the squash and Calum started to look a little tired as Magnus pulled away to a 21-7 victory. This left the Swede needing only 10 points in the tennis which he reached comfortably to give him his second Belgian Open title following victory in 2004. John beat an injured Marcel to finish third. Calum Reid, Scotland. "Not this time either." Peter Sákovics won another veterans' title in Belgium, and he certainly deserved the victory as he beat Richard Whitehouse, Volker Sach and Jacob de Vries on his way to claiming gold. Very strong squash and good tennis gives Peter a strong 'second half', and this was demonstrated perfectly by the fact that he didn't lose a set in either on his way to winning the veterans' title. Interestingly in this event, all four seeds reached their spot in the semi-finals, with Peter beating Volker in the bottom half and Jacob overcoming Englishman Ray Simpson in the top half. Volker went on to finish third. In the over 55 veterans, Ken Bound won, just as he did last year here at the World Championships. 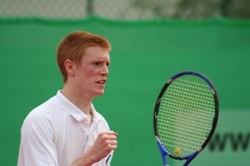 The doubles events are becoming ever more seriously and fiercely contested, as various pairings throughout the Racketlon world in both mixed and men's doubles become standardised and the quality increases. In the mixed doubles the German pair of Altmann/Kudicke won from seed one position, and they weren't properly tested throughout the event. They beat the German  Swedish pairing of Seifert/Porsborn in the final, Ollie & Silke's doubles success probably has a lot to do with the fact they enter most tournaments together  familiarity with your partner is always worth plenty of extra points! This also probably explains why the surfer boys of Germany play so well together, so well in fact that in the men's doubles final they should have won against Calum & Marcel, who both still had singles semi-finals to think about. Ollie & Alex went into the tennis 2 points clear after an excellent squash display (21-9! ), and considering they beat Marcel & Melzer at tennis, they were strong favourites. Calum & Marcel must have played superbly though (I say that as I didn't watch it although I heard plenty of cheering and applause), as they took the tennis 26-24 and then won the gummiarm point!! One error was made at the presentation though as Gert said it was the first gummiarm finish to a doubles final  British Open 2004 between Mattson & Larsson, Macey & Doherty ended in a gummiarm win for the Swedes. Nevertheless it was a great doubles final and hopefully we shall see plenty more of them in the future. O'Donnell & Nordstrand finished third after beating Twisterling & De Vries. 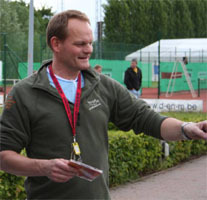 On site tournament director Jan Vercamme. The man behind 16 King of Rackets tournaments in Oudenaarde. As I've said before this was a great tournament as it is every year; and the countless volunteers and workers at the Recrean are what make it such a great tournament. If only we could harness this enthusiasm and bring it to our own countries it would make life a lot easier!!! Well done Belgium.